Being second has its advantages. JD.com, China’s number two e-commerce company, has set an indicative range for its initial public offering that values it at around $23 billion. That’s far behind the $100 billion-plus price tag attached to rival Alibaba. But it leaves room for a decent performance. Next to Alibaba, JD.com is an also-ran. It had 6.8 percent of China’s online shopping market in 2013, while its larger rival had around 84 percent, according to figures from iResearch. Moreover, JD.com loses money because it is investing heavily in logistics to handle delivery of its products. That’s an overhead that Alibaba, which matches buyers and sellers online, doesn’t have to worry about. The best way to value JD.com up is as a multiple of its forecast sales. Assume that transactions on JD.com grow at the same 31 percent rate as the Chinese market is forecast to expand this year, and 55 percent of that value is converted into revenue. In that case, JD.com’s top line for 2014 would be 91 billion yuan ($14.6 billion). Amazon, another serial investor with razor-thin margins, trades at 1.5 times this year’s sales, based on Eikon estimates. On the same multiple JD.com would be worth $22 billion – at the low end of the company’s IPO range. 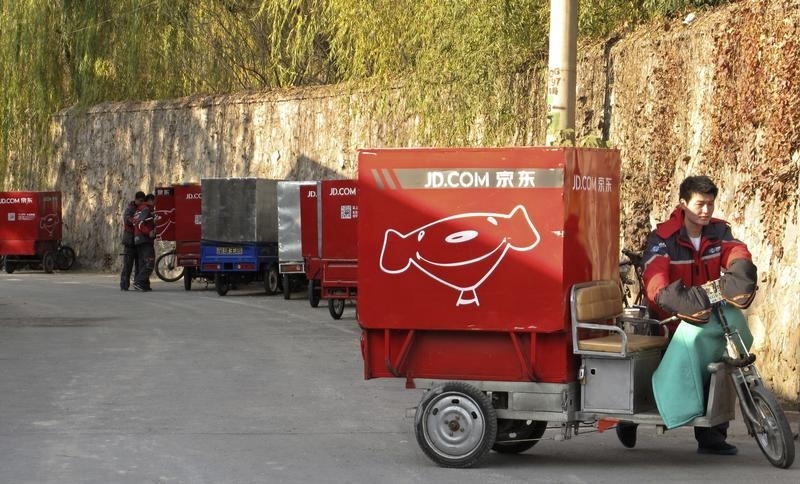 An alliance with social network giant Tencent could give JD.com a boost, though. The gaming group will soon direct more than 355 million users of its WeChat app to JD.com’s sites. That could transform the company’s share of China’s mobile e-commerce market, which currently looks to be about 7 percent. Each additional one percent share of the mobile shopping market that JD.com is able to grab in 2014 would add almost $300 million to its revenue. So if JD.com’s share of the mobile market doubled, it could add $3 billion to the company’s value. None of this matters unless JD.com can convert top line growth into earnings. But the company should be able to raise its gross margin from the current 10 percent by cutting its reliance on low-margin electrical appliances, which make up almost two-thirds of sales. Rival Japanese e-commerce group Rakuten shows what to aim for – it trades at 2.4 times revenue, thanks to its 16.5 percent operating margin. JD may be years from that kind of profitability, but with a small improvement there’s much to hang on for. JD.com, China’s second largest e-commerce company by goods sold, said it planned to price its initial public offering on New York’s NASDAQ between $16 and $18 per American Depositary Share. Each ADS comprises two regular shares, giving a potential valuation of $23.2 billion, at the midpoint of the range. JD.com processed transactions with a gross value of 125.5 billion yuan ($20.2 billion) in 2013, consisting of its own inventory and third-party sales. Electrical appliances accounted for 64 percent of sales, from 80 percent in 2011. Some 18 percent of JD’s orders came through mobile platforms in March 2014, compared with 6 percent in December 2012. The company reported 69.3 billion yuan of revenue in 2013, a 68 percent increase on the previous year. The company sealed an alliance with Tencent in March, as part of which the gaming company will direct users from its social networks and WeChat messaging app to JD.com’s services. Tencent agreed to buy 15 percent of JD.com’s shares for $215 million at the time, and take a further 5 percent stake in the IPO. Mobile shopping made up 9.2 percent of China’s total online shopping market in 2013, according to iResearch. The consultancy estimates that by 2016, mobile will make up 20.5 percent of the total market.